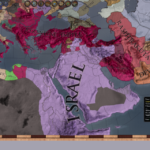 Crusader Kings II is one of my favorite games, a medieval dynasty simulator that lets you play the role of a ruler in the Middle Ages, trying to expand your territory and ensure your families continued power and prosperity. It has a tendency to produce various wacky and charming stories, which I like to record in a humorous fashion. 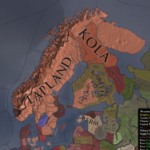 Click to expand, and enjoy my adventures! 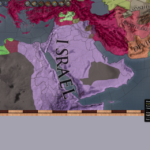 In The Promised Land RELOADED, I play as the Ethiopian Jews of Semien in Crusader Kings II, attempting to build the Third Temple, recreate the Kingdom of Israel, and stay out of the clutches of my doctors. 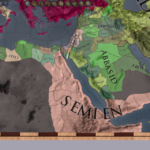 Part One: In which the Petty Kingdom of Semien becomes part of Abyssinia. 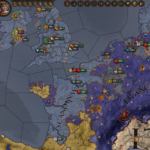 Part Two: In which I get a visit from Death herself and acquire a few more counties. 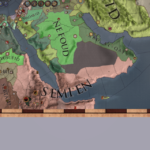 Part Three: In which Semien regains its independence, and I fail to achieve immortality. Part Four: In which I expand, fight rebellions, and fall into the hands of doctors. 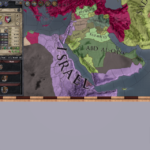 Part Five: In which my daughter is the spawn of Satan, and the Arabian Empire collapses and I reap the profits. 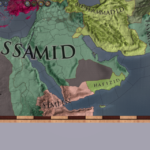 Part Six: In which my borders reach the Mediterranean, I surmount a succession crisis, and face a jihad. 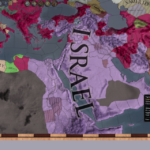 Part Seven: In which I survive further jihads and an attack by the Byzantine Empire, take Jerusalem, and go mad. 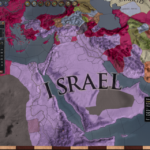 Part Eight: In which I defeat my first Crusade, build the Third Temple, and create the Empire of Israel. 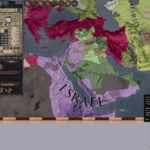 Part Nine: In which I wage holy war, survive the Black Death, and eat people. 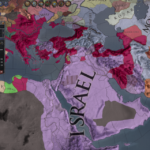 Part Ten: In which the I wage even more holy wars but the Jews fail to take over India. 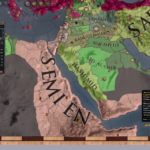 Part Eleven: In which I survive a difficult regency and unite the Arabian Peninsula. 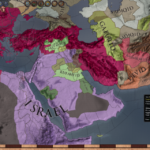 Part Twelve: In which I fight the Byzantines while the Mongols approach. 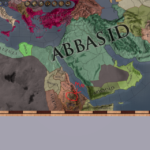 Part Thirteen: In which the Mongols turn out not to be that big of a deal, and I take Constantinople. 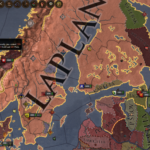 Part Fourteen: In which I continue to battle the Byzantines, and my vassals take Norway. 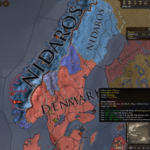 Part Fifteen: In which owning Norway turns out to be kind of a pain. 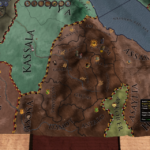 Part Sixteen: In which I take Rome, a chunk of India, and the Middle Ages comes to a close. 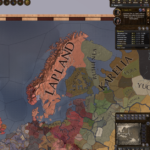 In How Do I Vike, I play as Norse pagans in Crusader Kings II, attempting to unite Scandinavia under my banner and spread the worship of Odin and Thor! 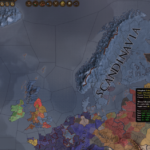 Part One: In which I don’t actually become a Viking. 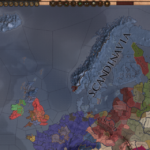 Part Two: In which I deal with succession issues, get conquered by Denmark, and start learning to set things on fire. 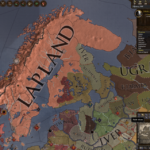 Part Three: In which I free myself from Danish rule, create the Kingdom of Lapland, become a Viking for real, and have an immortal dog who eats people. Part Four: In which I pledge myself to dark powers and devour my own children. 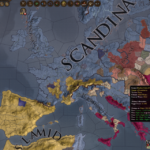 Part Five: In which I reform the Germanic religion and adopt feudalism. Part Six: In which the kingdom threatens to break apart. Part Seven: In which I harass Robin Hood and deal with seniority succession. 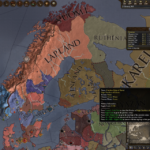 Part Eight: In which I have another mad queen and inch closer to my dream of empire. 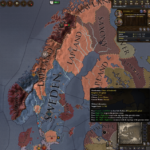 Part Nine: In which I establish ultimogeniture succession, create the Empire of Scandinavia, and name my horse chancellor. Part Ten: In which the invasion of England begins. 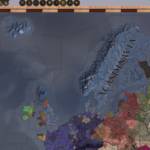 Part Eleven: In which I inherit Austrasia, complete the conquest of England, and survive the Black Death. 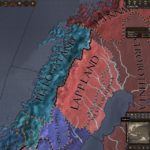 Part Twelve: In which I add Scotland to the bag, fight off a Crusade, and sleep with my horse. 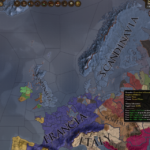 Part Thirteen: In which I complete the conquest of the British Isles and win a Great Holy War for France. 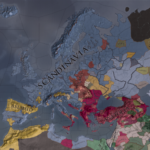 Part Fourteen: In which Germany and more of France fall before the Scandinavian juggernaut. 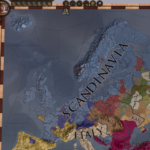 Part Fifteen: In which I break the power of the Mongols and take Italy. Part Sixteen: In which I declare victory. 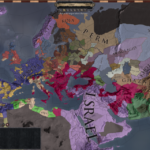 In Pax Romana 2: Electric Boogaloo, I being as a humble Byzantine Strategos and attempt to rebuild the Roman Empire and restore its former glory!